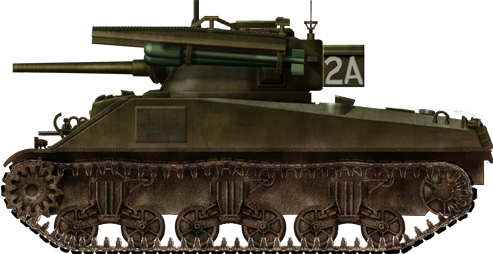 During WW2, men of the Canadian 12th Manitoba Dragoons, part of the 18th Armoured Car Regiment, were looking for a way to increase the firepower on their American built Staghound Armored Cars. They were only armed with a 37 mm (1.46 in) anti-tank gun. The Dragoons’ job on the battlefield was reconnaissance and to call in artillery support. If they ran into enemy opposition they needed a more powerful weapon to help them get out of trouble and get back to the safety of their own lines. 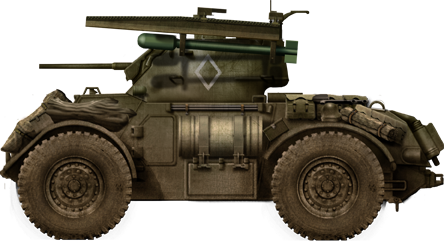 On 19th November 1944, four Royal Canadian Air Force (RCAF) Rocket Launcher Rails Mk1 were attached to the turret of an HQ Company Staghound, two on each side. They were loaded with 60 lb RP-3 (Rocket Projectile 3-inch) air to ground aircraft rockets that were normally fitted to planes like the Hawker Typhoon, Hurricane, Republican Thunderbolt, Mosquito, Liberator, Swordfish, Fairey Firefly and Beaufort. 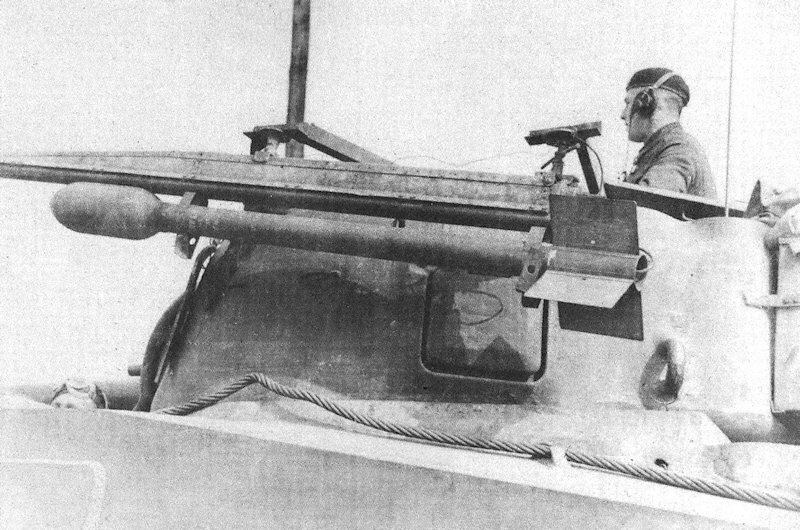 The rocket launcher rails were attached to the 37 mm gun’s mantlet. This enabled them to be moved up and down. Rotating the turret moved the rockets left or right. During tests, it was found that accuracy, especially in the terms of range, was poor. Some rockets failed to explode when fired at targets close to the vehicle. The maximum range achieved was 3,000 yards (2750 meters). No Staghounds fitted with rockets were used in action. This was a battlefield prototype. 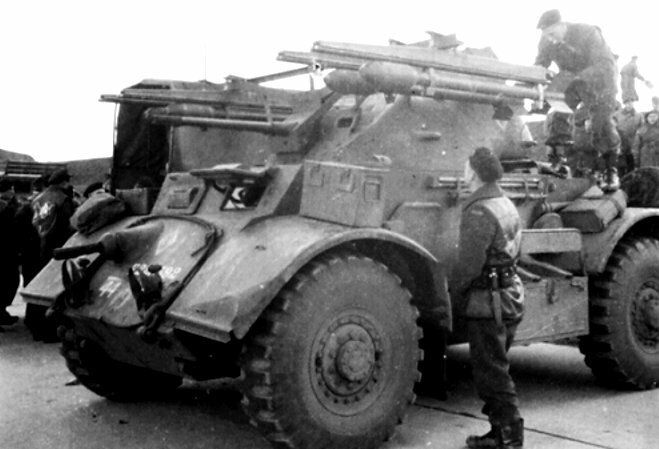 The turret of this Canadian 12th Manitoba Dragoons Staghound Armored Car was fitted with four 60 lb RP-3 (Rocket Projectile 3-inch) air to ground aircraft rocket launcher rails in November 1944. Lieutenant Robert Boscawen, from the British 1st Armoured Battalion, Coldstream Guards, 5th Guards Armoured Brigade, Guards Armoured Division and his friend Captain Dermot Musker, were the first to add the 60lb rocket firing capability to a Sherman tank. 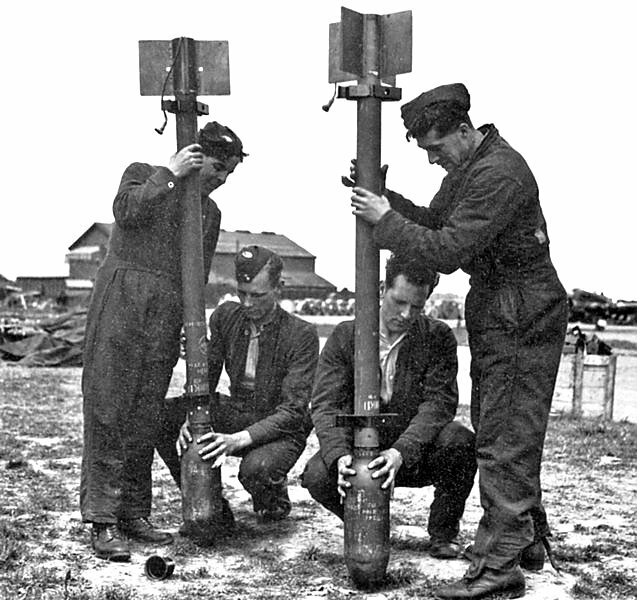 The Rocket Launcher Rails Mk.I and RP-3 (Rocket Projectile 3-inch) rockets were obtained from an RAF Typhoon aerodrome near Nijmegen. Captain Musker had heard that the Canadians had fitted some Typhoon rockets to a tank as an experiment but had never developed the idea. 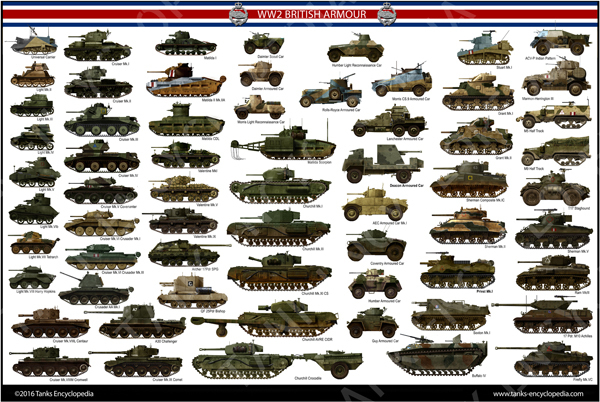 The first Sherman tank was equipped with the two rockets on Friday 16th March 1945. Lt Boscawen welded rocket launching rails on his tank on the following day and conducted a successful test firing. The decision was then made to arm the whole squadron and later the battalion with rockets. It was a short range blunderbuss weapon that would deliver a very impressive loud explosive immediate response to being ambushed as tanks advanced along close-country roads and village streets in the Netherlands and Germany. It was not meant to be a highly accurate weapon that could hit moving targets. They were designed to saturate the immediate area, kill and shock any surviving enemy combatants into surrender. By Friday 23rd March 1945, with the help of the Brigade’s L.A.D. (Light Aid Detachment) fitters, nearly all the tanks of No.2 Squadron had been fitted with double rockets on either side of the turrets. On Wednesday, 28th March 1945, a demonstration of the rocket’s capabilities was organized for the General. Sixteen rockets were successfully fired at once into a sandpit. It was like the equivalent of a Navy destroyer’s broadside. The rockets were given the code name ‘Tulips’ because of their shape. Lt Robber Boscawen, No.2 Troop commander, No.2 Squadron, 1st Armoured Battalion, Coldstream Guards, 5th Guards Armoured Brigade, Guards Armoured Division. 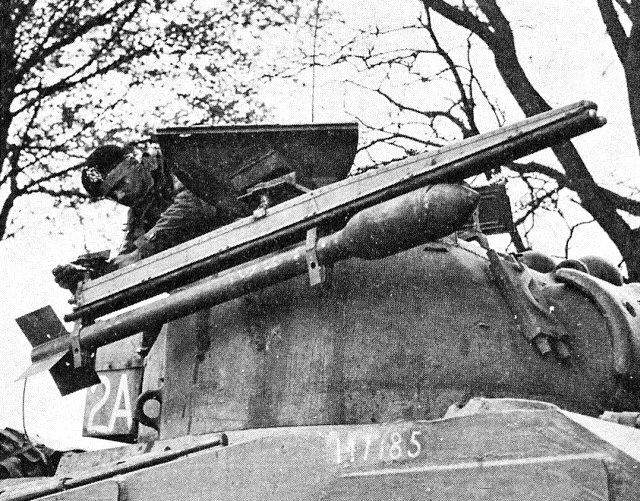 In his book, Armoured Guardsman, Lt Boscawen’s comment on this photo was, “Fitting a single rocket – code name Tulip – to one of my tanks. Shortly after we bolted a second rocket beneath to double up the warheads and improve trajectory.” No photograph of that four rocket configuration on a Sherman tank turret has yet been found. This British unguided air to ground rocket projectile was designed to be used by fighter-bomber aircraft like the RAF Typhoon, against targets such as tanks, trains, buildings, ships and U-boats. The RP-3 was also known as the 60 lb rocket because of its 60 pound (27 kg) warhead. The three-inch designation referred to the diameter of the rocket. The rocket was 55 inches (140 cm) in length. Eleven pounds (5 kg) of cordite propellant were packed inside the 3 inch (76 mm) steel tube rocket body. This was ignited by an electrical wire entering the tube at the rear of the rocket between the fins. Seven different warheads could be screwed onto the top of the rocket body. The normal one was the six inch in diameter (150 mm) 60 lb HE/SAP high explosive semi-armor piercing shell (27 kg). 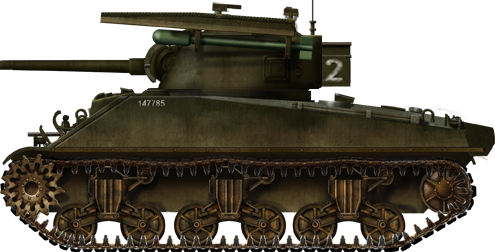 A solid 25 pound (11 kg) 3.44 inch (87 mm) AP armor piercing shell could be fitted instead. The AP rockets were not used by the tanks of the Coldstream Guards. They wanted the rockets to deal with infantry and anti-tank guns. This photograph of RAF aircrew connecting the body of two RP-3 (Rocket Projectile 3-inch) air to ground rockets to their high explosive 60lb warhead, gives you an idea of how long they were. 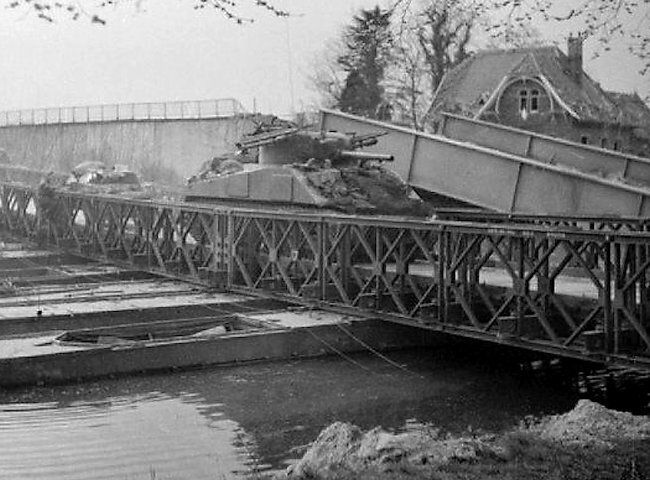 Tulip equipped Sherman tanks, belonging to the 1st Armoured Battalion, Coldstream Guards, 5th Guards Armoured Brigade, Guards Armoured Division, were involved in the action near the bridge over the Twente Canal between Enschede and Hengelo, in the Netherlands, on the 1st April 1945. Lt Boscawen’s No.2 Troop of five tanks was leading the way at maximum speed down a concrete canal road to take the bridge by surprise. No.2 Squadron’s armored car had managed to rush over the bridge first. Sergeant Caulfield’s Sherman Firefly had turned right to cross the bridge and follow the scout car but spotted a German four gun 8.8 cm flak battery to his left. He opened fire as he crossed the bridge. Lt Boscawen’s Sherman Mk.V tank was following. His tank fired its 75 mm (2.95 in) gun and machine guns at the German gun emplacement. It was protected by high earth mounds so he launched both his rockets. At the same time, the canal bridge was blown up by German engineers and his tank was hit in the petrol tank by a German shell that caused the tank to catch fire. Only Trooper Bland and Lt Boscawen managed to get out of the burning tank. Both were badly burnt. On a second occasion, British infantry was being troubled by enemy infantry in a wood. Two troops of tanks fired two rockets each from about 400 yards. Thirty to forty German infantrymen, including “Brandenburgers” came out of the wood afterward and gave themselves up. They were extremely shaken. There were several other occasions of this nature. Rockets fired from Sherman tanks of the Coldstream Guards were used in action in Germany as the division headed towards Hamburg. Near Lingen, because of the devastating effects of the rockets, a German officer complained to his captors that he believed the rockets were against the Geneva Convention and not allowed. 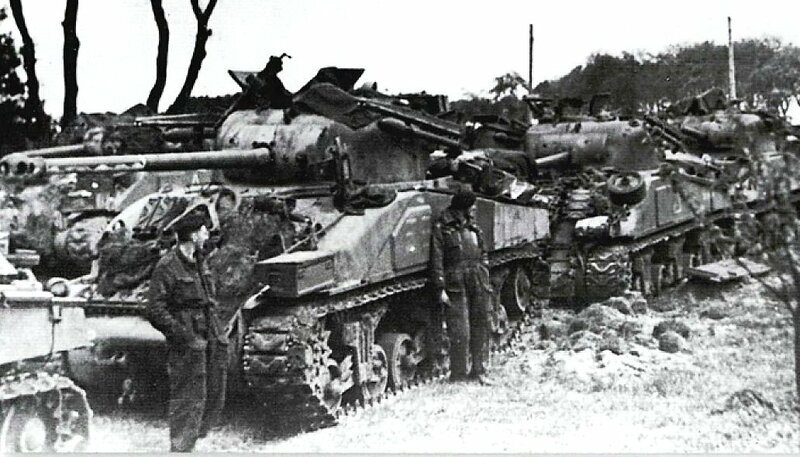 Sherman Firefly Mk.IC behind a Sherman Mk.V tank of No.2 Troop, No.2 Squadron, 1st Armoured Battalion, Coldstream Guards, 5th Guards Armoured Brigade, Guards Armoured Division. Both are armed with ‘Tulip’ rockets. This is a summary of a report submitted by 1st Armoured Battalion, Coldstream Guards, 5th Guards Armoured Brigade, Guards Armoured Division – It was decided to have one rocket set to hit anything that got in its way up to about 400 yards and the other one up to about 800 yards. This required the setting of the brackets to be at 150 mm and 160 mm above the horizontal respectively. The morale effect, especially against ordinary troops, was tremendous. It often resulted if the enemy surrendering after witnessing a rocket barrage. In the type of fighting encountered in Germany, it was found that rockets were the most effective against troops in woods and buildings. On one occasion, after a squadron had fired all its rockets and a number of other missiles at a barracks, it was found that there were about 40 dead in the buildings after the battle was over. The hitting power is like that of a shell. The explosion caused by the rocket is slightly greater than that than that of a medium shell. The rocket was found effective in removing road blocks and barricades when they were covered by enemy fire. It worked better than ordinary HE and AP shells. 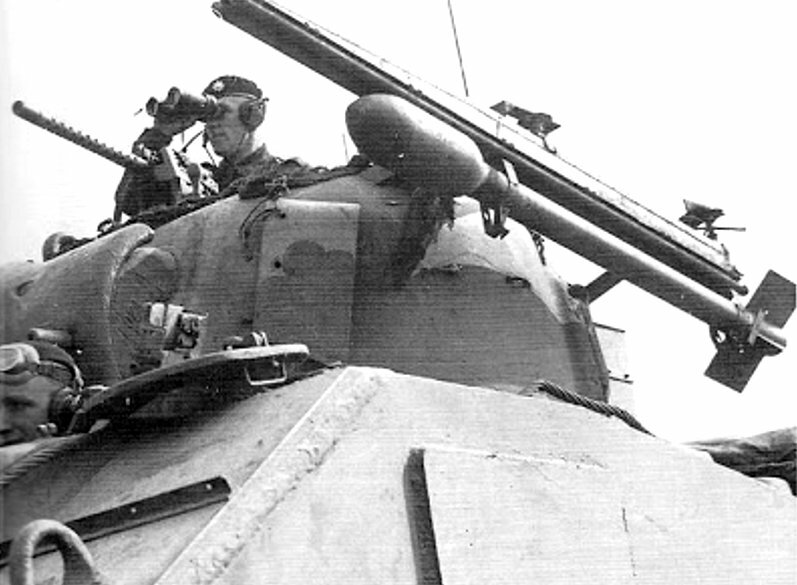 They were not used against any enemy tanks chiefly because very few AFVs were encountered at close range and because they lacked aiming accuracy. The general conclusion from the report was that the performance of the rockets when deployed ‘proved most satisfactory’. 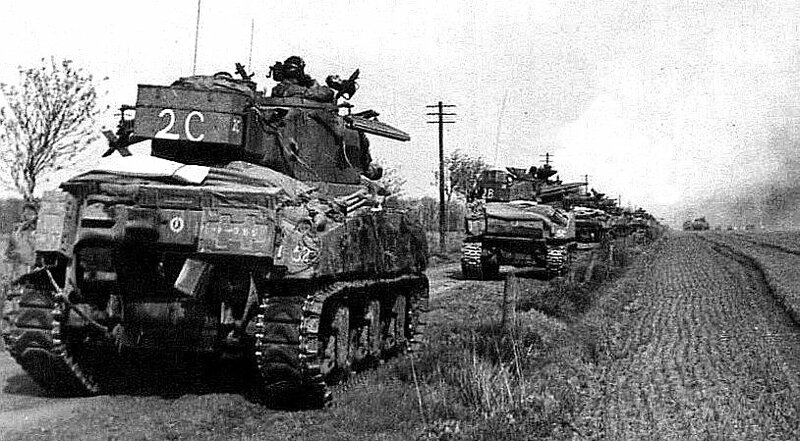 The results were limited because many of the tanks of No.2 Squadron, 1st Armoured Battalion, Coldstream Guards, 5th Guards Armoured Brigade, Guards Armoured Division were lost in action or through normal mechanical break-downs. There was only one accidental launch of a rocket caused by a German air burst artillery shell fragment that severed the electrical wire and generated enough electrical charge to ignite the rocket propellant. No rocket attached to the side of a Sherman tank turret was exploded by enemy small arms fire. SAP warheads need a good primary charge to set them off. It would be possible to set off the propellant in the 3-inch tube, but the amount of propellant was small and would not damage the tank turret. It was not seen as a weapon that would replace the main gun as a precision weapon but as a secondary armament of the one-shot variety against large targets. Appendix ‘B’ to 21 Army Group AFV Technical Report No. 26. Cromwell tank fitted with 60 lb RP-3 (Rocket Projectile 3-inch) air to ground aircraft rocket launcher rails. British Sherman Mk.V tank fitted with 60 lb RP-3 (Rocket Projectile 3-inch) air to ground aircraft rocket launcher rails. 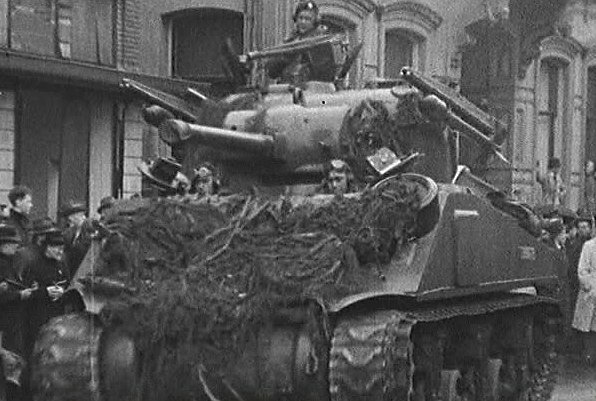 Notice that the ‘Tulip’ rocket on the right-hand side of this British Sherman Mk.V tank is pointing up in the air at a higher angle than the one on the left-hand side. One would be set to a range of 600 yards and the other 800 yards. British Sherman Mk.V tanks fitted with ‘Tulip’ rockets. The ‘Tulip’ 60 lb RP-3 (Rocket Projectile 3-inch) rockets were ignited by an electrical current sent along a cable that entered the rear of the rocket between the fins. 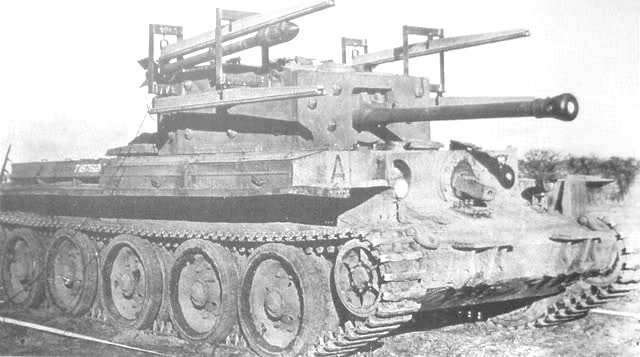 Cromwell Tulip tank prototype armed with four 60 lb RP-3 (Rocket Projectile 3-inch) rockets. Official British War Department test figures show that the 17pdr anti-tank gun firing armor piercing AP rounds would penetrate the following thickness of homogeneous armour plate and these distances: 500 yrds. (457 m) = 119.2 mm; 1000 yrds (914.4 m) = 107.3 mm and 1500 yrds (1371.6 M) = 96.7mm. When firing armor-piercing capped (APC) rounds at face-hardened armor plate these are the test results: 500 yrds. (457 m) = 132.9 mm; 1000 yrds (914.4 m) = 116.5 mm and 1500 yrds (1371.6 M) = 101.7 mm. When fired at slopped armour it was estimated there would have been 80% success at 30 degrees’ angle of attack. Official British War Department test figures show that the 75 mm M2 gun firing armor piercing AP rounds would penetrate the following thickness of homogeneous armour plate and these distances: 500 yrds. (457 m) = 64.4 mm; 1000 yrds (914.4 m) = 55.9 mm and 1500 yrds (1371.6 M) = 48.5 mm. When firing armour piercing capped ballistic capped (APCBC) rounds at face-hardened armor plate these are the test results: 500 yrds. (457 m) = 64.5 mm; 1000 yrds (914.4 m) = 56.5 mm and 1500 yrds (1371.6 M) = 50 mm. When fired at slopped armour it was estimated there would have been 80% success at 30 degrees’ angle of attack. Official British War Department test figures show that the 75 mm M3 gun firing armor piercing AP rounds would penetrate the following thickness of homogeneous armour plate and these distances: 500 yrds. (457 m) = 73.2 mm; 1000 yrds (914.4 m) = 63.2 mm and 1500 yrds (1371.6 M) = 54.5 mm. When firing armour piercing capped ballistic capped (APCBC) rounds at face-hardened armor plate these are the test results: 500 yrds. (457 m) = 73.75 mm; 1000 yrds (914.4 m) = 65.4 mm and 1500 yrds (1371.6 M) = 57.8 mm. When fired at slopped armour it was estimated there would have been 80% success at 30 degrees’ angle of attack. Under the artwork the date should say,March 1945 not March 1944. Thank you for the notification Jase, it has been corrected! Hi, just thought I’d mention the way the British Guards unit is refered to is incorrect (this unit is especially confusing). 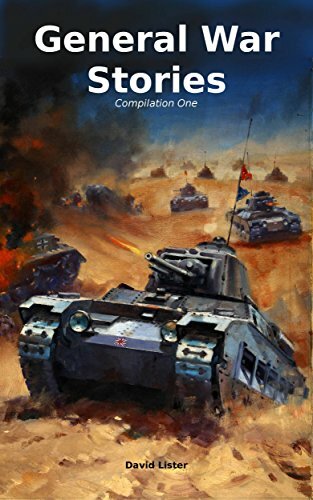 The Division is called the “Guards Armoured Division” with it’s component Brigades made up of Battalions taken from each of the 5 Foot Guard Regiments (Coldstream, Grenadier, Welsh, Scots & Irish). The Battalion being refered to was called the “1st Armoured Battalion, Coldstream Guards” (as in the 1st Battalion of the Coldstream Guards Regiment in peacetime) & was a tactical component of the 5th Guards Armoured Brigade of the Guards Armoured Division (British Line Regiments didn’t have limitations on Battalion numbers as they never fought as a Regimental formation but provided Battalions to tactical formations). Thanks for the great site, hope this helps.